Just thought I’d share an little anecdote about Klout. I have 2 Twitter accounts, thus 2 Klout profiles. I have one personal Facebook profile. I have public pages for my blogs as well but had linked my Facebook account to Klout before the ability to link pages was available. My personal Facebook profile was linked to JustBooks4Kids. While poking around on the Klout site to see about adding Facebook to my NicholeAnnCom profile I was brought to a page that said I could merge accounts. As I suspected my accounts weren’t actually merged but rather the link to my personal Facebook profile was switched from JustBooks4Kids to NicholeAnnCom. NicholeAnnCom went from 27 to 42. JustBooks4Kids went from 42 to 27. So apparently my personal Facebook profile is worth 15 points! In case you are wondering, I have 203 “friends” on Facebook and rarely use it as a platform for my blog posts. In fact, while I’m on Facebook all the time (thanks to some amazing private groups) I don’t really post much on my profile at all anymore. I just checked and I only have 8 updates for February so far. It’s maybe more interesting to note that BOTH my twitter accounts are worth 27 Klout points. NicholeAnnCom has around 850 followers. I’ve only tweeted from it 275 times as I’ve only really started using it the past few months. But I’ve been favoring it lately and using it the most because I want to keep the other account more on the topic of books. JustBooks4Kids has around 1200 followers. I’ve been slacking and not tweeting from this account as much but I’ve been using it a lot longer. I guess I shouldn’t be surprised that my scores flipped the way they did considering that the Facebook link was the only change I made recently. Yet somehow I didn’t expect such a clean and clear score change since Klout is notorious for keeping users in the dark in regards to scoring. 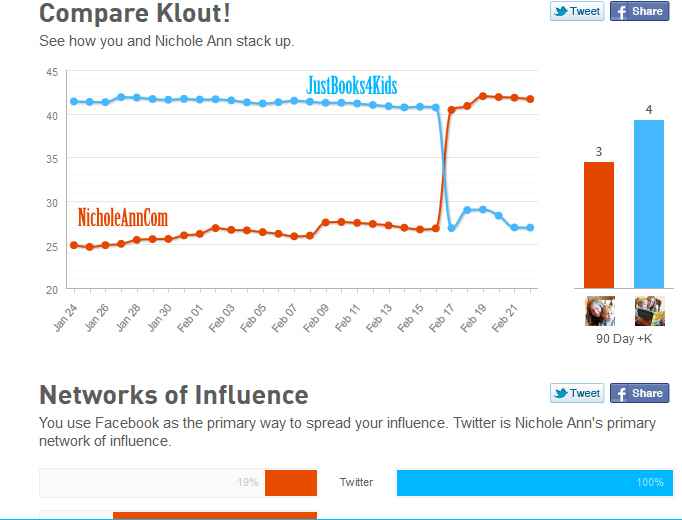 More surprising to me was that both twitter accounts are valued the same by Klout. What does this all mean? Not much in the grand scheme of things but, since I found it interesting, I thought I’d share. BTW, as of today, I’ve connected my JustChildrensBooks Facebook page to my JustBooks4Kids klout profile. We’ll see how or if that affects my new lower score.